When the organizers of the Frankie Manning 95th Birthday Festival cooked up the idea of having lindy hop scenes from all over submit videos of themselves doing the Shim Sham line dance, we had no real expectations for how many would come in, or from where. I remember telling co-organizer Shorty Dave that "if we got 10 decent videos from the major lindy hop scenes in the country, and four more from four different countries in the world, I'll be satisfied." Well, we exceeded that modest goal by leaps and bounds. We have nearly 130 videos from more than 20 countries from around the world — from as far away as the Canary Islands, Kuala Lampur, Tokyo, and Lithuania! Check out the neat Google Map of all the sites created by Shorty Dave above! The shim sham in 3D! Really they are all wonderful in their own unique ways. 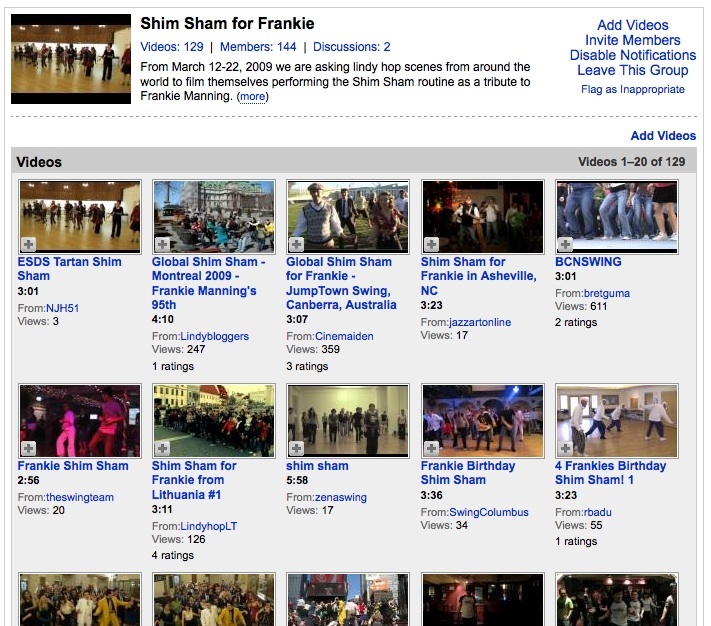 That thousands of people got together to do this for Frankie and share it with others on our YouTube Group is a great example of the kind of community we are at our best. Ease of Organization: Most scenes of swing dancers have one very popular weekly dance that draws out most of their lindy hop community on a consistent basis. And the "Shim Sham" is the most popular swing line dance performed around the world. So getting people together to do the shim sham is not terribly difficult to organize. Technical Requirements: Good quality video cameras are become quite common around the world. And many people already have the experience of uploading a video to YouTube. So the technical requirements for participation seemed achievable by your average scene. Focused Timeframe: We targetted a specific set of days that we called "Frankie Week" in March to get everyone doing it at the same time. That way the earlier folks could inspire the later folks, and people could feel like they were participating in something global. Instant Gratification: The YouTube Group quickly enabled participants to enjoy the fruits of their labors, and let others see it for themselves. Fun! : The idea of getting together, perhaps in special costumes or in special public locale, to record a video that will be seen by hundreds or even thousands just sounds like a fun activity. Cheap: Doesn't require any financial outlay to participate, as long as you already have a camera and internet access. A Good Cause: The idea of doing this to celebrate Frankie Manning is very motivating for lindy hoppers, who revere this 94-year old dancing legend. These are good lessons to keep in mind for future viral campaigns that I'm involved in. Now starts the hard part — creating a cohesive and fun compilation video of the best of these videos to present at the Festival in May. I think its going to be a painful process of figuring out the best of the best. Luckily this is being produced by the very capable filmmaker Akemi.